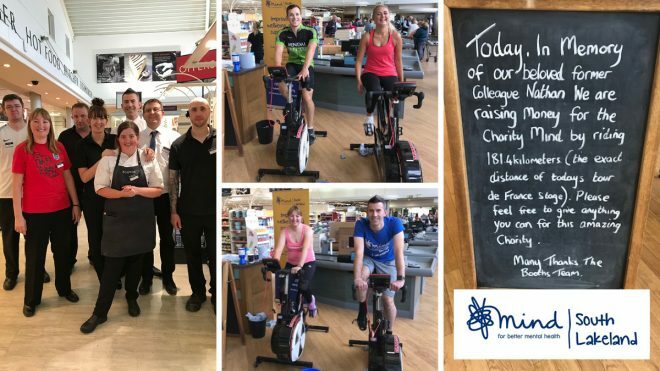 On Saturday 14th July our Kendal store colleagues challenged themselves to ride 181km on two static bikes donated by Kendal Leisure Centre – the equivalent of that days’ leg of the Tour de France. They decided to complete the challenge in store to raise money for South Lakeland MIND in memory of much-loved colleague Nathan, who they sadly lost earlier this year. The charity works hard within the local community to improve wellbeing and support anyone with mental health issues. An incredible 438.2km was covered across the two bikes more than doubling our target, and I’m proud that so many of our store colleagues put in so many kilometres in memory of our Nathan. I’m even prouder to say that we managed to raise £517.65 for MIND. Thank you to all who came and supported us on the day. We’re extremely proud of our Kendal colleagues for their efforts and a big thank you from us too to anyone who showed their support on the day. If you’d like to donate online, you can tap here for South Lakeland MIND’s Just Giving page.